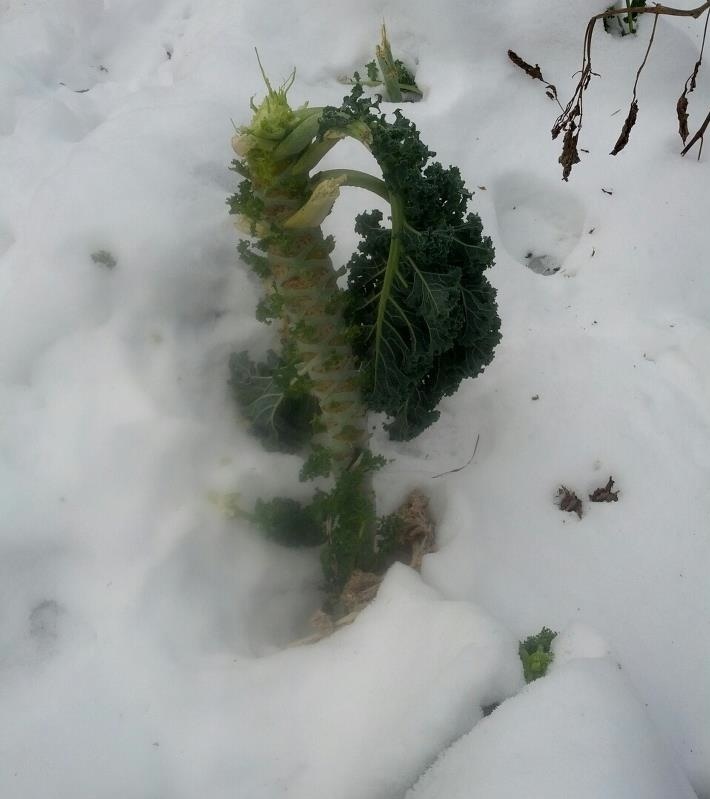 365 Days of Kale: Front yard gardeners - guard your kale! A true story from a friend in town, complete with photo. Warning to all front yard gardeners on the west side of Ann Arbor, MI - guard your kale and other veggies! "My dog is begging to go outside so she can finish off this frozen kale plant. She runs for it every time we go outside. She has learned to harvest her own food. Our gardens are no longer safe. She loves raw kale. And collards. And asparagus. And is wild about tomatoes. She has even grabbed them from front yard gardens we've walked by before I could stop her. Front yard kale, ready for the last harvest, bark, bark, mine, yum, yum! My friend is Linda Diane Feldt who wrote the terrific book Spinach and Beyond: Loving Life and Dark Green Vegetables in 2003. It is still the best cookbook I've seen out there devoted to this wide array of delicious and healthy vegetables. Who knows, perhaps it was Linda Diane who actually started the "kale kraze" that has swept the country (and beyond since this blog gets visitors from all around the world each and every day). However, point taken here with Linda Diane's anecdote about her dog's taste in vegetables is variety, variety, variety rules the day. I have been called the 'queen of kale', but today at our farmers' market, I bought broccoli leaves, red cabbage, lettuce, and swiss chard. I'll get some kale next week, but I also love variety both for taste and for the uncountable different health-promoting phytochemicals that come all packaged up in each type of vegetable. So to the increasing crowd of front-yard gardeners, you can't say you haven't been warned. There are dogs out there who know what's great to eat, but I do agree with my friend that a dog eating asparagus is a major crime! This story is so funny and so true. We adopted a dog in October and have discovered she loves kale. We also have a rabbit, so while taking kale from the fridge for bunny, our dog made an interception. I had planned on planting kale in the back yard this year. I think I may have to fence in the garden!